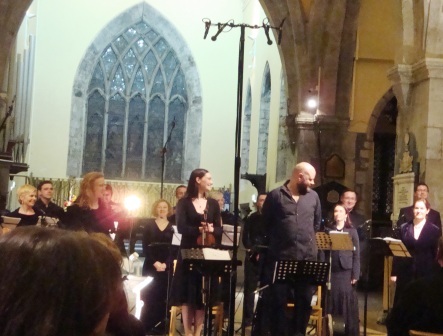 St. Nicholas’ church hosted a concert which, among other things, featured a new arrangement of the Seán O’Riada mass. The 16 part composition was commissioned by the Louth Contemporary Music Society, and written by composer Dmitri Yanov-Yanovsky. I know what you’re thinking – that’s about as Irish as Wisniewski. He’s actually from Uzbekistan. Why not an Irish composer? As Eamonn Dougan, the conductor explained, the Seán O’Riada mass may have been too sacrosanct for an Irish musician to tackle. The program began with Siobhán Armstrong on harp (as those who follow this blog know, I’m a self confessed harp addict), who was then joined by Zoë Conway on fiddle and Robbie Harris on bodhrán. After a series of lovely tunes, the conductor and EQ Singers arrived to perform the mass. Was it better than the original? Not a question easily answered. There will always be two schools of thought on the subject. Maybe a better question would be – was it enjoyable? In that regard I can answer a clear ‘yes.’ The voices were spot on and the instrumentalists, top drawer. Would I buy the CD? With all due respect to the fine musicians and composer, I don’t think so. For some of us, some things are sacrosanct. When it comes to Shakespeare, I love seeing his plays, but cannot stand them performed in modern dress. That doesn’t mean they need to always be done in Elizabethan garb, but I just can’t warp my head around someone in a mini skirt or a 20th century military uniform speaking Elizabethan English. Nor could I comprehend someone in cross gartered stockings addressing Queen Elizabeth I in the following manner: “Yo, Lizzy! How’re they treating you at the Buck?” I can admire the musicality of the performance just as I can admire the talent of the actors in a modern-dress Shakespearean play; however, that doesn’t mean I’ll become a die-hard fan of either. Each version has its followers and neither can be considered entirely wrong. It’s all a matter of personal taste, and I’m sure there are many choirs in the world and a large number of listeners who will appreciate this new version. The sound that resulted as these musicians realized O Riada’s evolving vision wasn’t an exact replica of what traditional rural Irish musicians would have played. Musician Sean Mac Reamoinn, quoted on the RamblingHouse website, described it this way: “What O Riada was doing was developing the inner logic of the music, and the only parallel I can make is that of jazz, where he was giving different instruments their head. They did their break, as it were, but he managed to weld them into a unity. And the sound that emerged, with tunes that many of us knew for a long time, was quite exciting.” The new freedom of O Riada’s versions of traditional music helped motivate his uilleann piper, Paddy Moloney, to form the Chieftains, a group that has inspired countless younger musicians. Ironically O Riada, with one foot still in the world of classical music, regarded his protege’s creation with ambivalence.